Fiber optic attenuator is a device to reduce the power level of an optical signal, either in free space or in an optical fiber. Why Fiber Optic Attenuators Are Needed? Most people believe bigger signal power level is better, right? Beginners in fiber optic technology are often confused with why optic attenuators are necessary to reduce light intensity. Aren’t we using amplifiers to increase the signal power level? The truth is that too much light can overload a fiber optic receiver and degrade the bit error ratio (BER). To achieve the best bit error ratio, the light power must be reduced. Or in a multi-wavelength fiber optic system, you need to equalize the optical channel strength so that all the channels have similar power levels. This means to reduce stronger channels’ powers to match lower power channels. 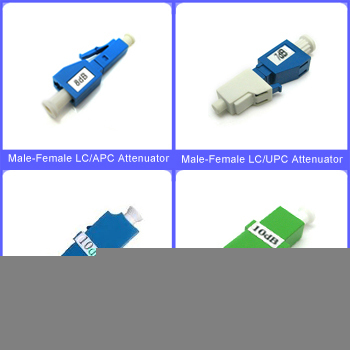 Fiber optic attenuator is the device who works in above cases perfectly. 1. Attenuators are permanently installed in a fiber optic communication link to properly match transmitter and receiver optical signal levels. 2. In fiber optic power level testing. Attenuators are used to temporarily add a calibrated amount of signal loss in order to test the power level margins in a fiber optic communication system. How Does A Fiber Attenuator Work? The power reduction are done by such means as absorption, reflection, diffusion, scattering, deflection, diffraction, and dispersion, etc. Attenuators usually works by absorbing the light, like sunglasses absorb the extra light energy. Attenuators typically have a working wavelength range in which they absorb the light energy equally. They should not reflect the light since that could cause unwanted back reflection in the fiber system. Or by scattering the light such as an air gap. Another type of attenuator utilizes a length of high-loss optical fiber, that operates upon its input optical signal power level in such a way that its output signal power level is less than the input level. Optical attenuators can take a number of different forms and are typically classified as fixed or variable attenuators. Fixed Attenuators Fixed attenuators have a fixed optical power reduction number, expressed in dB, such as 1dB, 5dB, 10dB, etc. A -3dB attenuator should reduce intensity of the output by 3 dB. Their applications include telecommunication networks, optical fiber test facility, Local Area Network(LAN) and CATV systems. Fixed value attenuators are composed of two big groups: In-line type and connector type (or build out style). In-line type looks like a plain fiber patch cable, it has a fiber cable terminated with two connectors which you can specify types. Connector type attenuator looks like a bulk head fiber connector, with a male connector interface on one end and a female interface connector on the opposite end. The connector style is typically fabricated with either air gap attenuation or doped fiber attenuation. It mates to regular connectors of the same type such as FC, ST, SC and LC. 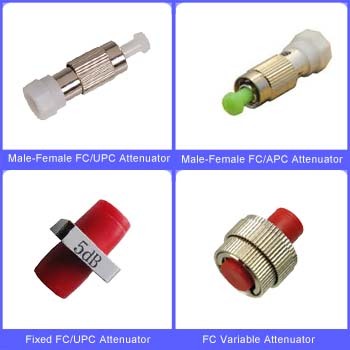 The female to female fixed attenuators work like a regular adapter. But instead of minimizing insertion loss, it purposely adds some attenuation. 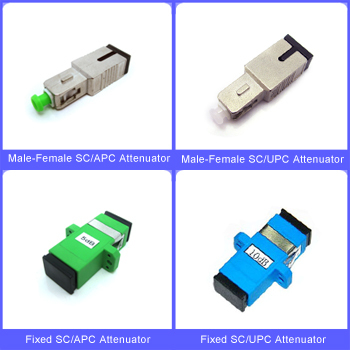 The male to female fixed attenuators work as fiber connectors, you can just plug in your existing fiber connector to its female side. Variable Attenuators The attenuation level can be adjusted, such as from 0.5 dB to 20dB, or even 50dB. Some variable attenuators have very fine resolution, such as 0.1dB, or even 0.01dB. This is critical for accurate testing. For precise testing purposes, engineers have also designed instrument type variable attenuators. These instrument type attenuators have high attenuation ranges, such as from 0.5 dB to 70dB. Variable attenuators are general used for testing and measurement, but they also have a wide usage in EDFAs for equalizing the light power among different channels. The female to female variable attenuators are adjustable by turning a nut in the middle. The nut adjusts the air gap in the middle to achieve different attenuation levels. The in-line patch cable type variable attenuators work as regular patch cables, but your can adjust its attenuation level by turning the screw. range from 1dB to 30dB optional. Work in 1250 to1625nm range, with optional attenuation value from 1dB to 30dB. Work in 1250nm to 1625nm range, with attenuation range from 1dB to 30dB optional. Work in 1250nm to 1625nm range, with attenuation range from 1dB to 30dB optional. Work in 1250nm to 1625nm range, with attenuation range from 1dB to 30dB optional.